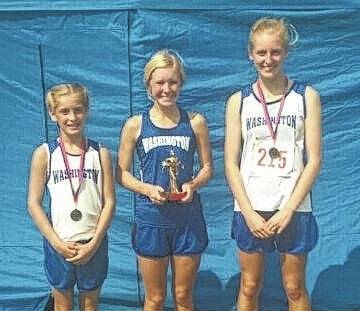 The top placers for the Washington girls cross country team at the Zane Trace Invitational Saturday, Sept. 10, 2016 are (l-r); Chloe Lovett, 12th in the middle school race; Maddy Garrison, first place in the high school race and Cloe Copas, 7th in the middle school race. KINNIKINNICK — Washington junior Maddy Garrison won her third race in four meets Saturday, Sept. 10, taking first place in the Zane Trace Invitational. Garrison defeated a field of 119 other runners with a first place time of 20:00.1. Ivy Beam of Zane Trace was second in 20:43.1. Washington was fifth as a team with 115 placement points. Rayana Burns was 17th as a team member in 25:45.9. Alexa Harris was 26th as a team member in 27:06.9. Ally Funari was 32nd as a team member in a time of 27:42.1. Haley Copas was 39th as a team member in 29:32.1. Tahja Pettiford was 50th as a team member in 31:28.0. Megan Rohrer was 51st as a team member in 31:37.4. Raven Haithcock was 94th overall in 32:38.8; Abby Tackage was 96th overall in 33:02.1; Mallory Whitworth was 100th overall in 33:33.4; Grace McLaughlin was 115th overall in 39:12.7 and Bianca Rogers-Wright was 118th overall in 39:40.3. Miami Trace’s Saylor Preston was 82nd overall in 31:17.5. Kylie Munro was 112th overall in 37:59.1; Mackenzie Munro was 114th overall in 38:27.7. For McClain, Natalie Cunningham was 92nd overall in 32:29.3. For Hillsboro, Caitlin Ahrmann was 16th overall in 24:25.2. Vinton County won the high school girls team event with 39 placement points. The Vikings placed three runners in the top ten. River Valley was second with 65 points, edging Westfall, which had 67 placement points. Waverly was fourth (112) and Adena was sevent (184) out of nine teams. In the boys high school race, Washington was 10th (268) and Miami Trace was 11th (295). Hillsboro was 14th with 355 points and McClain was 16th out of 17 teams with 414 points. Waverly won the boys race with 58 placement points. The Tigers’ Hunter Hoover won in a time of 17:27.9. There were 162 competitors in the high school boys race. For the Blue Lions, Connor Lane was 34th as a team member in 20:14.8. Josh Trimmer was 41st as a team member in 20:34.6. Chris Conger was 60th in 22:04.2; Brandon Underwood was 66th in 22:15.8; Will Baughn was 67th in 22:17.7; Nick Geiler was 81st in 23:43.6 and Collin George was 85th in 24:09.2. Also for the Blue Lions, Ethan Stewart was 118th in 24:41.0; Kalub Wilkerson was 135th in 26:22.3; Keiya Sato was 150th in 29:10.8 and R.G. Crabtree was 156th in 30:02.8. For Miami Trace, the first runner to finish was Nick Foody, 45th as a team member in 20:49.9. Cole Enochs was 50th as a team member for the Panthers in 21:23.5. Wyatt Cory was 61st as a team member in 22:08.1. Caleb Perry was 65th as a team member in 22:13.2. Kody Burns was 74th as a team member in 23:05.3; Jake Atwood was 80th as a team member in 23:39.7 and Skylar Lyons was 99th as a team member in 26:32.6. Also for Miami Trace, Matthew Warner was 148th overall in 29:00.8. Justin Scott was 22nd for Hillsboro in a time of 19:41.6. Cannon Woolridge was 29th for McClain in 20:04.5. In the middle school boys race, Miami Trace’s Bo Little placed third out of 116 runners with a time of 12:30.7. Miami Trace placed fourth out of 13 teams with 122 placement points. Eli Fullerton of Belpre won the race in 11:37.9. Washington’s Branton Dawes was the top placer for the Blue Lions, 35th overall in 14:28.6. For Miami Trace, Weston Melvin was 12th as a team member in 13:05.3. Also for Washington, Caden Hott was 100th in 20:27.8 and Luke Rader was 106th in 21:09.3. The top placer for Greenfield was Ethan Burns (91st in 18:58.9). Ethan Parry was 8th as a team member (9th overall) in 12:47.3. In the middle school girls race, Washington’s Cloe Copas was 7th overall in 14:38.5. Chloe Lovett was 12th overall in 14:53.4. As a team, Miami Trace was 10th with 267 placement points. Kirsten Lucas was 32nd as a team member in 16:53.5. Kandice Mathews was 56th as a team member for Miami Trace in 19:49.2. Mcale Callahan of Miami Trace was 16th as a team member in 13:24.7. Also for Miami Trace, Jadon Rowe was 29th as a team member in 14:27.8; Kaiden Thompson was 62nd as a team member in 17:47.5 and Wesley May was 79th as a team member in 23:22.4; Makayla Barnes was 62nd as a team member in 22:38.0; Jamie Runnels was 63rd as a team member in 22:44.2 and Hajjar Elsayed was 65th as a team member with a time of 22:53.3. For Washington, Larrissa Berggren was 91st overall in 21:32.8. Mararah Bloom of Hillsboro won the middle school girls race in 13:22.7. Shana Beatty of Greenfield was 87th in 20:58.0. Miami Trace is next in action at the Aaron Reed Memorial Invitational at Southeastern High School (near Chillicothe) Saturday at 9 a.m.
Washington and Miami Trace will run at Tim Walters’ farm Wednesday, Sept. 21 at 5 p.m.